ep Dualfilter T.I.P.S. Filter Tips - The ultimate protection of pipette and sample against unintentional and unnoticed contamination by aerosols, drops and splashes. ep Dualfilter T.I.P.S. filter tips are filter tips with a two-phase filter for contamination protection. The two filter layers made of flexible, hydrophobic material, fit perfectly in the tip cone and retain practically 100 % of all aerosols1) and biomolecules. This filtering effect is achieved using various, well-defined pore sizes. The layer facing the sample provides protection from drops, splashes and aerosols. The layer facing the pipette cone functions as a second barrier from contamination, and dependably binds biomolecules. A defined air passage rate guarantees full sample recovery and the customary quick pipetting. 1) An aerosol is a colloid of fine solid particles or liquid droplets, in air or another gas. Scientifically Proven - No filter protects better than ep Dualfilter T.I.P.S.! Filter tips from various manufacturers were tested in a blind trial at the Fraunhofer Institute for Toxicology and Experimental Medicine (ITEM) in Hanover, Germany. Testing focused on the prevention of pipette cone contamination by aerosols. Filter effect with regard to salt aerosols and biomolecules (DNA fragments) was examined. Quantitative determination of DNA fragments was performed using real-time PCR. The results indicate that ep Dualfilter T.I.P.S. are much better at protecting against aerosols than other commercially available filter tips. With regard to particle permeability (0.13 % +/- 0.11 %), ep Dualfilter T.I.P.S. are 55 to 677 times more effective than the filter tips tested from other manufacturers. ep Dualfilter T.I.P.S. were 21 to 600 times more effective when protection against DNA fragments was examined (0.02 % +/- 0.01 %). 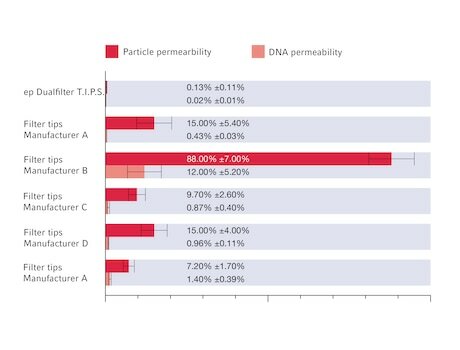 The worst measured results were for particle permeability 88.00 % +/- 7.00 % and for DNA permeability 12.00 % +/- 5.20 %. All filters of Eppendorf ep Dualfilter T.I.P.S., ep Dualfilter T.I.P.S. LoRetention and ep Dualfilter T.I.P.S. SealMax, are made of the same Polyethylene (PE) and have comparable pore size structure. For efficiency testing of filter tips no standardized test method exists. Thus a further study with ep Dualfilter T.I.P.S. SealMax was done based on the standardEN 1822. This standard deals with filtration performance testing of filters as used, for example, for applications in clean room technology or pharmaceutical industry. The results of the filter efficiency testing done by a certified institute showed a minimum particle collection efficiency of the ep Dualfilter T.I.P:S. SealMaxof 99.5 % with NaCI aerosol particles sizes of 0.05 - 0.5 µm. All ep Dualfilter T.I.P.S. are sterilized by electron beams, certified pyrogen-free and PCR clean (free from human DNA, DNase, RNase and PCR-inhibiting substances). Filter tips from various manufacturers were tested in a blind trial at the Fraunhofer Institute for Toxicology and Experime ntal Medicine (ITEM) in Hanover, Germany. Filter effect with regard to salt aerosols and biomolecules (DNA fragments) was examined. Quantitative determination of DNA fragments was performed using rea–time PCR. With regard to particle permeability, ep Dualfilter T.I.P.S. are 55 to 677 times more effective. They were 21 to 600 times more effective when protection against DNA fragments was examined for the first time. Both filters, ep Dualfilter T.I.P.S. and ep Dualfilter T.I.P.S. SealMax, are made of the same Polyethylene (PE) and have comparable pore size structure. A further study with ep Dualfilter T.I.P.S. SealMax was done based on the standard EN 1822. This standard deals with filtration performance testing of filters as used, for example, for applications in clean room technology or pharmaceutical industry. The results of the filter efficiency testing done by a certified institute showed a minimum particle collection efficiency of the ep Dualfilter T.I.P.S. SealMax of 99.5 % with NaCI aerosol particles sizes of 0.05 - 0.5 µm.